For my last culinary stop in France (for 2018) I wanted something special. 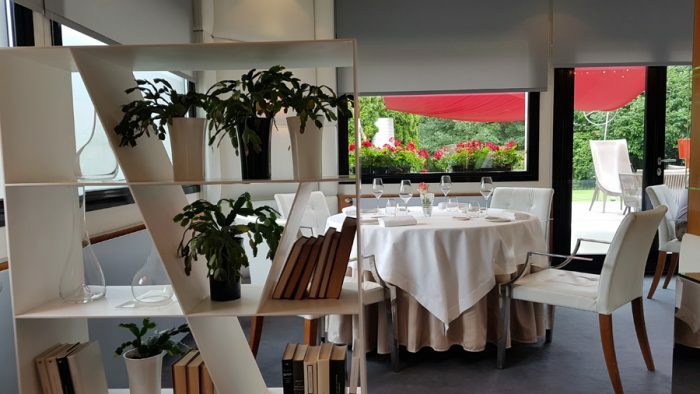 So I chose the *** L’assiette champenoise by Arnaud Lallement, the highest decorated restaurant in the champagne region. The interior is very modern – like the living room on starship enterprise 🙂 I found it quite charming, starting with the wonderful carpet, comfortable chairs up to the bookshelves. The service was very friendly, highly professional and spoke perfectly english. I could not resist browsing through the (electronic) wine list with 1089 (!) positions of champagne. Since I was driving I chose some glasses with the sommelier. 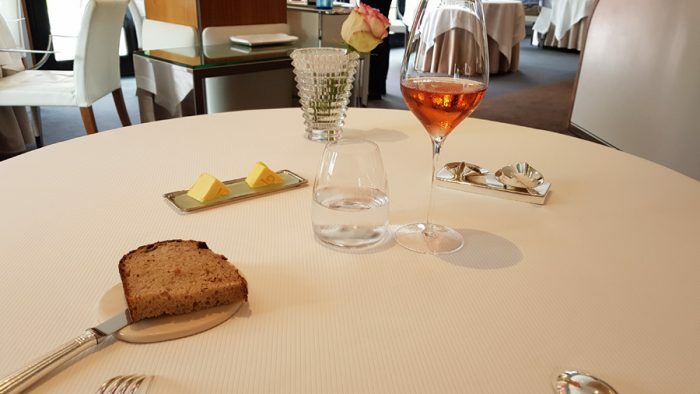 No baguette, but a wonderful rustic rye bread with excellent butter and a glass of Roger Coulon Rosélie Extra Brut (€ 18). 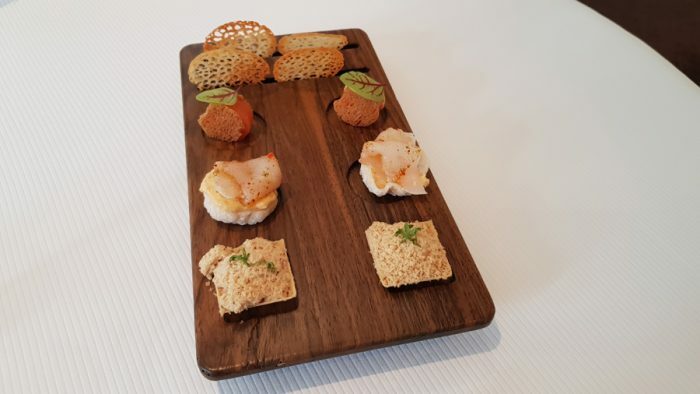 This very, very rustic amuse is a quote of local cuisine. 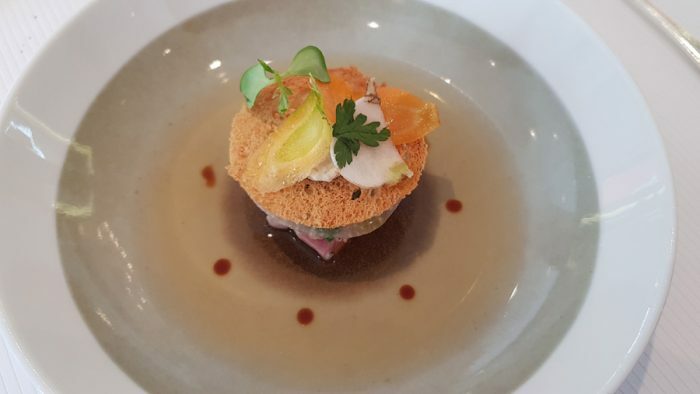 Although it was a very refined version of a dish usually served in pubs, the „brute“ taste of pickled pork, cabbage, bacon and soup didn’t entirely fit into the whole menu. 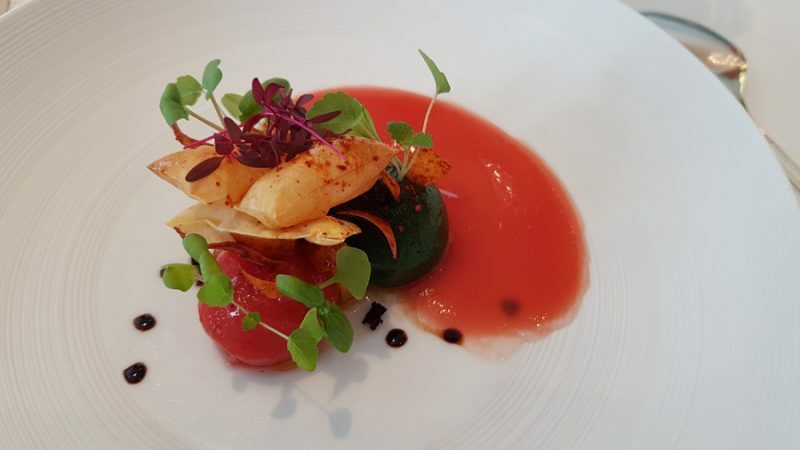 An very nice dish celebrating the beauty of summer and tomato: Different tomatoes, stuffed with other tomatoes and tomato sauce. 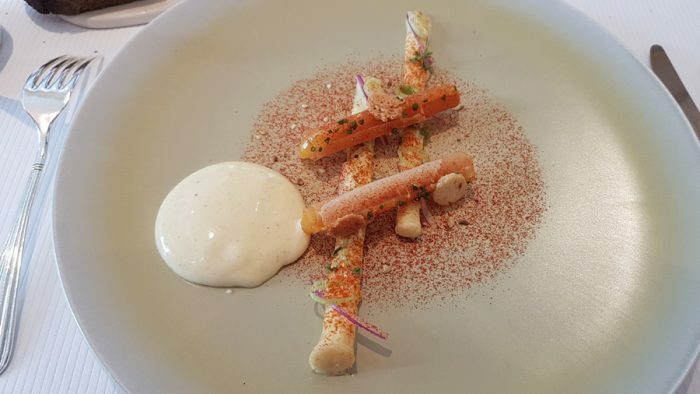 What sounds boring was indeed a very product centered dish, with a very balanced acidity. It was nice and surprising to explore the different nuances of the vegetables. The tomato water served alongside was surprisingly fresh and cleansing. Another vegetarian dish: Selected pieces of leek were given a twist with a very elegant vinaigrette of champagne vinegar. They paired with the fruity hotness of red sancho chilis and a sauce with Sichuan pepper. I liked the aromatic tickling of the pepper in the beginning, but it developed a very bitter aftertaste, that I did not like. 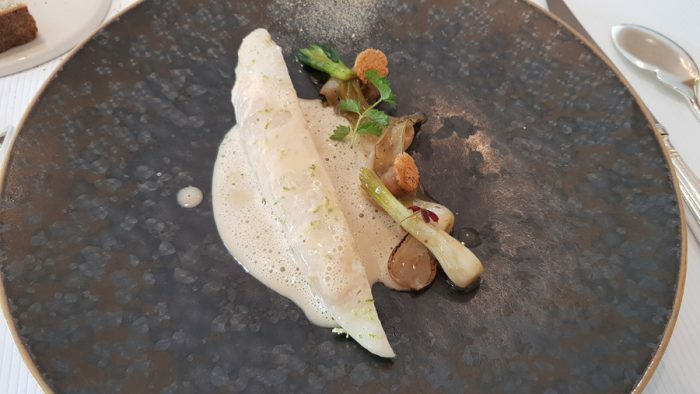 A perfectly prepared fillet of John Dory with different onions and a wonderful sauce with Noilly Prat reconciled me with the sauces again. It was nice to see that the service took the feedback on the sauce before seriously, since they asked it this sauce was to my liking and also Mr. Lallement stopped by to see if everything was alright. 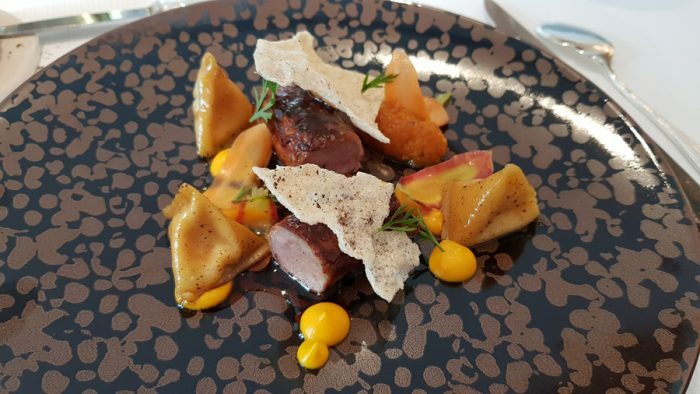 A rather comforting dish: Very nice meat quality, together with wonderful pasta and a very natural lamb juice – again with a very balanced acidity. The carrots gave a herbal sweetness to this great plate. 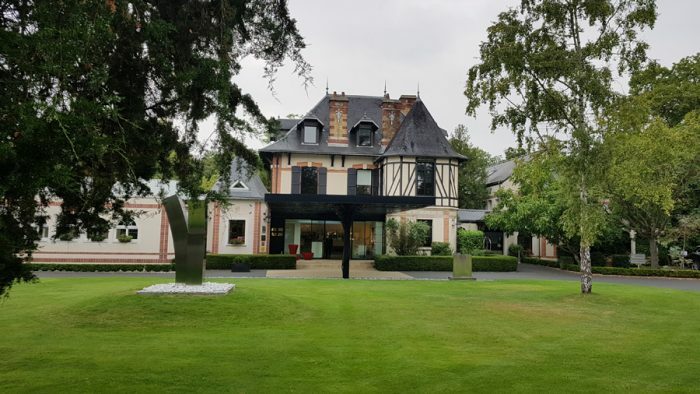 With it I had a wonderful glass of a highly elegant pinot Pommard „Les Vignots“ 2013 by Nicolas Rossignol (€ 24). 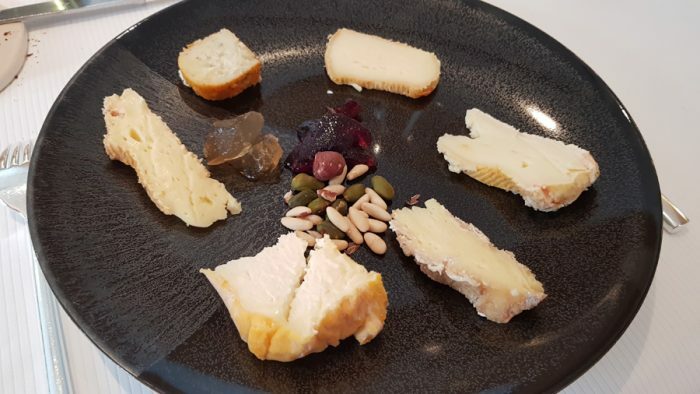 A wonderful selection of perfectly matured cheeses. Very simple, very good. 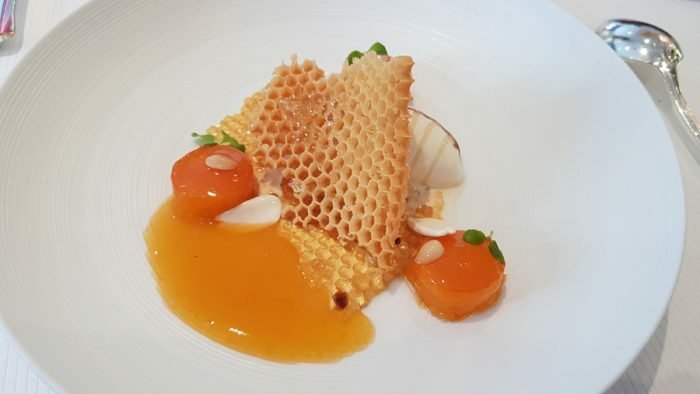 A very nice dessert, combining biscuit and almond with honey and fruity apricots. Very nice and versatile. I liked that it was very sweet but not simplistic – giving every spoon a slightly different taste/texture. A giant amount of petit fours for the finish: I loved the raspberry tarte and the fruit gums very much. The nougat was really excellent. 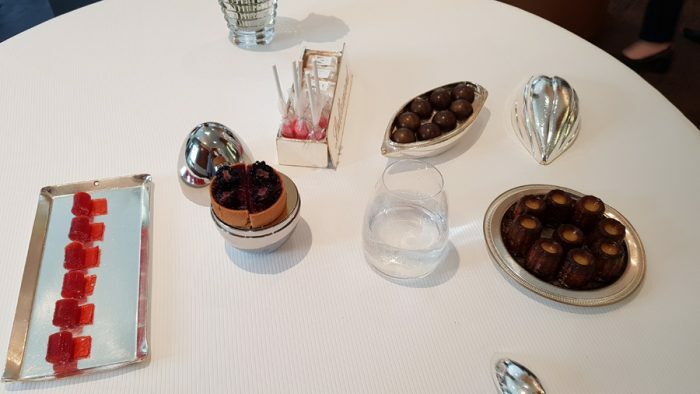 The waiters were very nice, since I asked to pack some of the lollipops for my son they made up a wonderful package adding some extras to take away.